When you work in bathrooms, the occasion will arise when you will need and want to mount something into tile. 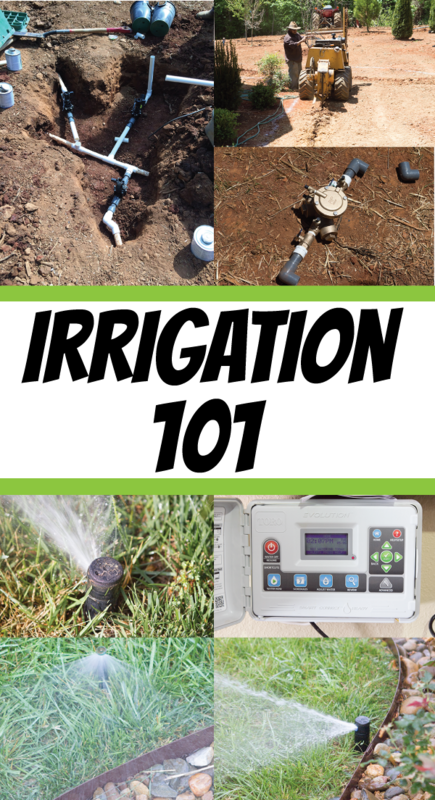 A little intimidating perhaps, but really, with the right tools and a few tips – it can be pulled off pretty effortlessly. It is one of what I’ll call Essential DIY Home Improvement Skills. As I mentioned in my last post, I was working in our daughters’ bath. A standard-type, what a builder might call – hall bath. 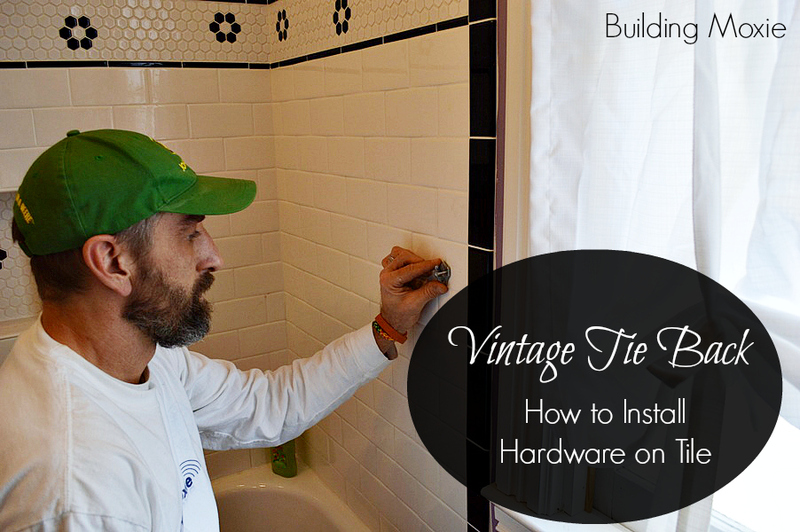 One rather small item I wanted to address was re-installing a vintage tieback for the shower curtain. It had been lying around for a few years, and truthfully, I’m amazed that it didn’t get misplaced. Right after I installed that 2-in-1 Handheld Showerhead (a Brizo Hydrati). With installing that shower head, I shot the first video (for our YouTube channel) and in essence, here … I just left the camera rolling. Now, I want to put out that I was drilling through, screwing into and mounting to a standard ceramic 3×6 subway tile. In the grand scheme of things, a softer material than say porcelain and many other natural stone tiles. Of course, the concern is with all that you can crack the tile you are trying score in this method and when screwing through. There are two tips that I offer in the vid that ensure that you don’t. First before drilling make sure that you score your tile. Because I was setting screws, I used a self-centering punch. (This is the one I have: Stanley self-centering punch – on Amazon.) You do this to not only break the surface of the tile, but also to minimize the possibility of skating with your bit when you begin to drill. Note: There are alternatives to the method I provide and I will cover a few of them below. Important! 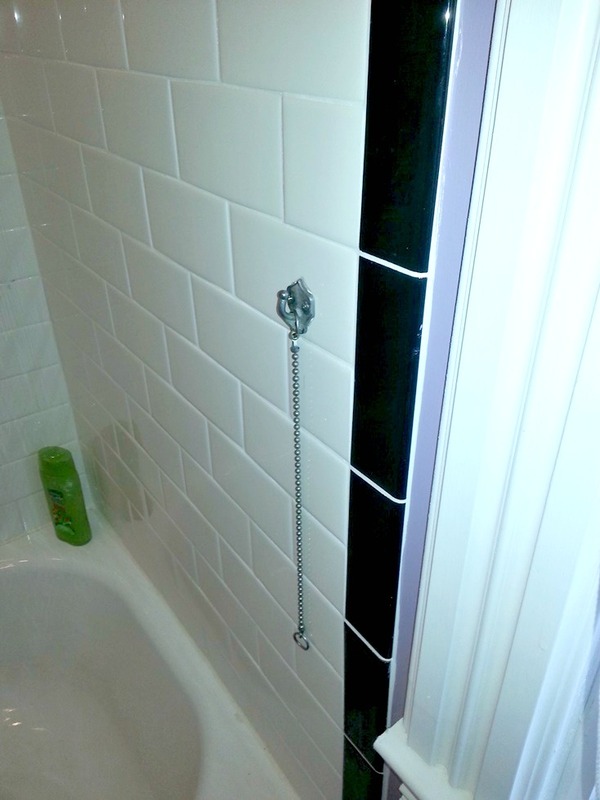 The procedure I provide should be avoided if you are within say an 1″ of the tile’s edge. Second, grab the proper bit. In my vid, I use a spear tip, tile and glass bit (like these). 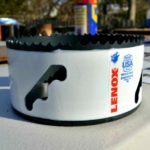 While it worked great for my application, in many other situations a masonry bit may work just as well … AS LONG AS you score your tile surface first. A key thing to remember is that friction and heat may play a role here. Drill using a relatively low speed. And the harder the tile is the greater importance of this. Use light pressure and let the bit do the work, backing off and clearing debris occasionally. Here are two articles that offer great tips on scoring and how to approach the task in general. One from DoItYourself.com, here and two from How Stuff Works, here. If you choose to pass on the center set option (a tool designed to set hinge screws in wood), there are other (light) impact options for scoring tile. You could use a pin punch, an awl (if you don’t care that it gets hammered) as well as any number of pointy objects will work as well. 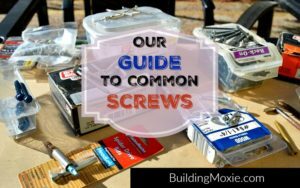 In a pinch, the tip of your screw or even a finish nail can work. The goal here really is to simply break the glaze in glazed ceramic tile. I could see the impact alone would make some nervous. Don’t fear there are others methods. Some suggest skating can be minimized by simply applying masking tape that the location where you will drill. (I find this is most times not enough). 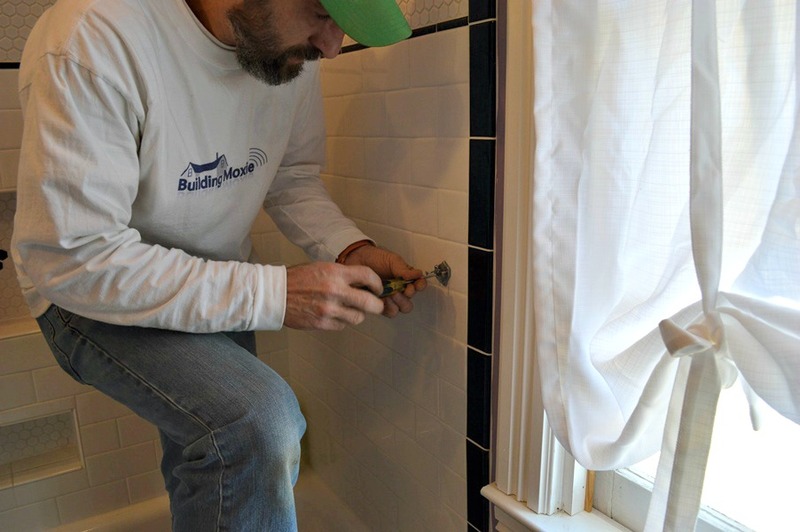 Start by applying the masking tape and then making an “X” on the tile at the spot using an awl, backer board knife, or a grout removal tool – this list could go on. Still others suggest forgoing scoring, instead using a jig of sorts. Notch on a drill an appropriately sized hole in a block of wood. Hold the jig in place over the drill location with your free hand. Note too that in this location for me there was no framing behind my tile, in other words – nothing to drill to. And you will find that frequently. While I thought about using an anchor, in the end – I decided against it. 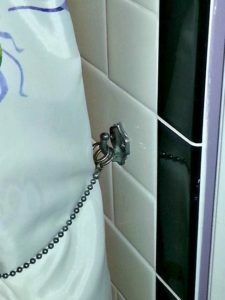 I was only installing a tie back and in the grand scheme of bathroom accessories … it wasn’t gonna get tugged on too much. 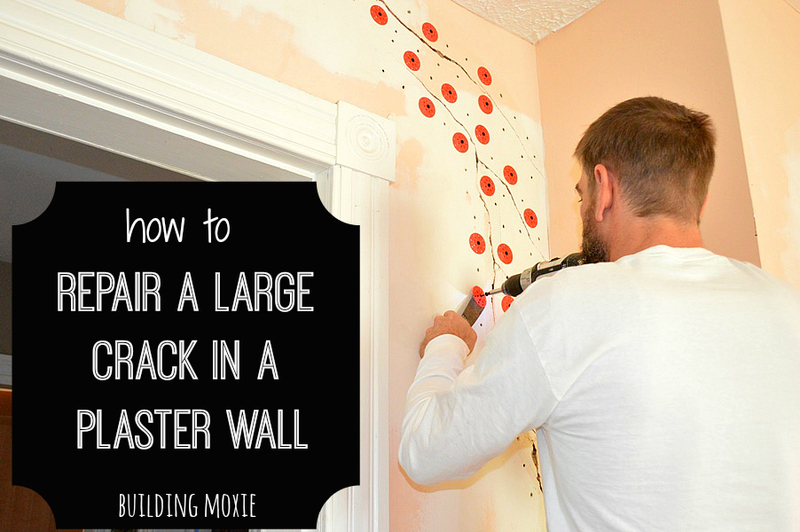 I fortified it with a dab of silicone caulk behind it. In my case and for added insurance – I verified that I had additional tile on hand … for the just in case. And you should too.